Ready for a different kind of challange? This is a VOR approach, but with two differences from those you're flown so far. DME Arc. For traffic arriving from the wrong direction—as you will be doing on this flight—the approach plate stipulates a DME arc rather than a procedure turn. 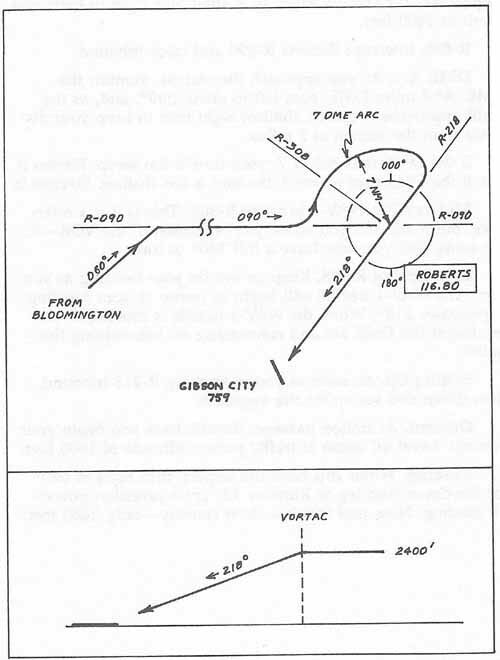 In order to intercept the radial leading to the airport, you must first fly a wide arc around the VOR—maintaining a constant distance of 7 nautical miles from the station. VOR-A Approach. The approach is labeled VOR-A rather than VOR RWY X. This indicates that the approach guides you to the airport, but not to a specific runway. In this case, you arrive at the airport roughly 90° to the airport's single runway, and you must then turn one way or the other and fly a standard pattern to land. In addition, the runway length here is only 2400 feet. You may find this a bit more difficult than the previous approaches because of these new twists; keeping a constant 7 miles DME from the station, in particular, will take some practice, but it's a very satisfying procedure once you get the hang of it. You'll take off on Bloomington's Runway 3, then turn right to 060° on your climb, intercepting the R-090 radial inbound to Roberts. Then, as you approach the Roberts VOR, at about 8 miles DME, you'll turn left to about 060° and then will start a shallow right turn to circle around the VOR on a constant 7-mile radius. The trick here is to control the steepness of the turn—so that you remain 7 miles DME from the station all the way around. If the DME falls below 7, your turn is too tight; you'll need to flatten out your bank and get back to 7 miles DME. If the DME increases above 7, the turn is too shallow; you'll need to steepen your bank. This will be a long, slow procedure with a turn of more than 180°, so you'll have to be patient. As your heading begins to approach 218°, the NAV-1 needle will begin to move toward center. At that point, you'll forget the DME and will intercept the 218° radial inbound. Once on the radial, you'll slow down and set up for the approach. You could set up for the approach back before starting the arc, but it's a long way around, and the time required for the approach would be increased substantially—ATC might ask you to expedite. At station passage, you'll throttle back and begin your descent to the airport; when you have the runway you'll turn right and fly a standard pattern to land south on Runway 18. The approach is outlined in Figure 4-6, and the actual plate is provided in Chapter 5. Departure. Take off on Runway 3; then turn right to 060° and climb to 2400 feet. R-090. Intercept Roberts R-090 and track inbound. DME Arc. As you approach the station, monitor the DME. At 8 miles DME, turn left to about 060°, and, as the DME approachs 7, start a shallow right turn to keep your distance from the station at 7 miles. If the DME falls below 7, your turn is too steep. Flatten it out. If the DME rises above 7, the turn is too shallow. Steepen it. Midway Fix. NAV-2 is set to R-308. This is just a reference, but it will tell you when you're abreast of the VOR—in the sense that you now have a full 180° to turn. Intercepting R-218. Keep an eye on your heading as you turn. The NAV-1 needle will begin to center as your heading approaches 218°. When the NAV-1 needle is moving to center, forget the DME arc and concentrate on intercepting the radial. Setting Up. As soon as you're tracking R-218 inbound, slow down and set up for the approach. Descent. At station passage, throttle back and begin your descent. Level off again at traffic pattern altitude of 1600 feet. Landing. When you have the airport, turn right to 000° for the downwind leg to Runway 18. Try a precision power-off landing. Note that this is a short runway—only 2400 feet.